Congratulations and well done Mike Tattersall. An even better finishing time than 2007. It was on a cold sunny February day climbing towards Greenhow that I made my mind up I would have a go at the Paris Brest Paris 1200km. Six months later after completing the qualifying 200, 300, 400, and 600km Audax rides I was picked up by coach by Baxter’s sporting tours, with Mike Tattersall, on a damp Friday morning in Manchester. The evening before the start was spent in very long queues, first to get in the official restaurant for a school dinner size serving of spaghetti bolognaise, barely enough fuel for the first 100km. Fortunately Roco, one of the guides from Baxter’s, had advised us to go very early because on leaving the restaurant the queue measured about 200 yards. The second queue was to get on the running track to get the brevet cards stamped before the start. After two hours of slowly being corralled towards the start line it was almost time to set off for Brest, near the back of a group of over 500 cyclists. The sky had clouded over and the showers started. The starts are staggered as the controls would not be able to cope with 5300 riders arriving close together. Just after 9.30pm a firework sounded the start of the ride. The first 15km of the ride was police escorted on closed roads. I had decided to set off quickly to try to avoid the chaos at the controls. I managed to gradually make my way through the peloton to within sight of the lead car before the end of the “neutral zone”. The first 140km to the first official food stop seemed to pass quickly with plenty of other riders to share the work on the front. After quickly eating a ham baguette I continued into the night on the damp Normandy roads. The large groups had now dispersed and I found myself riding with a Trike most of the way to the first proper control at Villaines La Juhel. I bought 3 croissants and a bowl of coffee at the control to try to keep awake on the next leg. The showers became more persistent as it gradually came light; the wet roads were covered in snails, slugs and squashed frogs. The wind seemed to strengthen and the straight exposed roads made progress more difficult. With the showers turning to persistent rain in the next 2 legs I took a little longer at the controls to eat more substantial food such a rice, pasta and rice pudding. The leg from Tinteniac to Loudeac was particularly difficult with strong head winds and rain for most of the way. 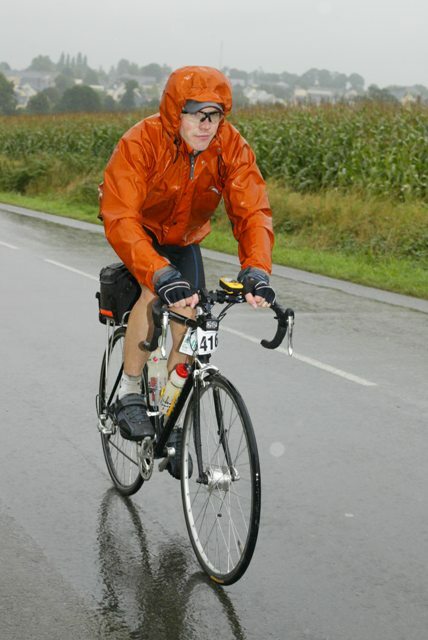 The rain eased leaving Loudéac as the route headed into the most undulating part of the course. A secret control was set up about half way to Carhaix. I arrived just after the first rider passed going the other way on the return with the first bunch of about 12 riders about 15 minutes behind. I met the 2nd of the Baxter’s coaches at Carhaix and tried to have a short sleep on the coach without success, so I decided to carry on to Brest. I set off for Brest just after dark with a group of Italian riders just off the back, trying to keep a safe distance as a few had started to wander over the road with fatigue. Just over the top of the first climb I pulled into a picnic site for a cat nap on a wet grass bank as the faster riders passed going the other way in a long fragmented line of dazzling white lights. The rest of the route into Brest was very hilly. The final stretch crossed the harbour on a long bridge; unfortunately the darkness limited the view. I arrived at the control, had a meal then headed for the make shift dorm of about 100 camp beds. I booked 3 hours sleep, put my earplugs in and fell asleep in seconds. Having been woken by a man with a torch, I headed back to the snack bar for breakfast feeling a lot less tired. The route back to Carhaix felt a lot easier as it takes a less hilly and more direct route. The sun came out and a tail wind made the long drag over to Carhaix much easier. The weather for the next day was very mixed. I arrived back in Fougeres as it started to rain heavily. I had another 3 hours sleep here before carrying on into the damp night. I had soup and pasta bolognaise for breakfast at Villaines La Juhel and again for lunch at Mortagne. The leg to the finish was very wet with heavy showers making navigating into the Parisian suburbs more difficult, but a few of the locals were on a lot of the junctions cheering all the riders into the finish. I finished at around 7:41pm and headed back to the hotel via a Chinese takeaway, an eagerly awaited shower and sleep. My time for the ride was 70 hours and 11 minutes.